Last weekend I arrived home from a fabulous and long awaited 18 day family vacation in the USA. My husband and I are celebrating our 20th wedding anniversary this year (see my post from last month) and this trip is a big part of our anniversary celebrations. 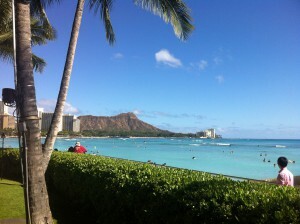 Our first stop was a 5 night stay in Waikiki. 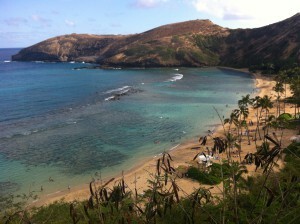 Hawaii is a 9-10 hour flight from Sydney, and a popular tourist destination for Aussie travellers. The US and Australia share many cultural similarities. I grew up watching American tv shows and movies, reading American literature, and dining at US fast food chains. American culture is familiar to most Aussies, and I feel at home when I visit the US. The pretty view of Diamond Head from our hotel. I spent time teaching my children about the subtle differences between our two countries. We’re not used to tipping in Australia, and we have right hand drive cars. It’s a bit disorientating at first to be travelling on the other side of the road. We naturally walk on the left hand side of the pavement rather than the right. When crossing the road we look the opposite way, and we need to remember that the traffic is coming from the left instead of the right. Our money is brightly coloured plastic bank notes, and we have to examine the US notes to determine the denomination. Quarters, dimes, nickels and pennies are different to our coins that range from $2 down to 5 cents. We toured Pearl Harbor and my children gained a WW2 history lesson from a USA perspective. I first visited Pearl Harbor 21 years ago and learned many new details about the significance and extent of the attack on Pearl Harbor. Visiting the USS Arizona Memorial and remembering how many lives were lost on December 7, 1941 is a sobering experience. 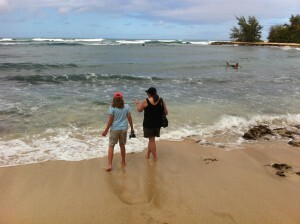 Watching sea turtles with my daughter at Haleiwa. 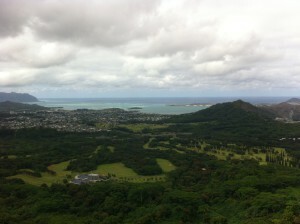 We also enjoyed a guided tour of Oahu and loved seeing the natural beauty of Hawaii. We saw sea turtles, mongoose and a variety of bird life. At Sunset Beach with my son. The surf was up at the famous Sunset Beach on the north shore. We learned about the history and culture of the Hawaiian Islands, including the Battle of Nu’uana that united the islands in the late 1700’s. The spectacular coastline on the north and south shores is different to Australia. We walked on the familiar Aussie sand that Hawaii imported many years ago from North Queensland. We loved our short time in Hawaii and can’t wait to return. Next month I’ll share the final leg of our USA trip in Oregon. Have you visited Hawaii? Do you have a favourite place in Hawaii that you’d like to visit? I’d love to have an opportunity to tour the other islands and see more of the stunning scenery. Any travel tips are appreciated. Thanks for sharing the photos from your trip, Narelle. I’ve never been to Hawaii, but I’d love to see Pearl Harbor and the sea turtles. What a wonderful way to celebrate your anniversary. Love reading your story. I have been 3 times, twice were short visits on the way to or from the states and Canada. The other time I had 13 days and loved it. Did a day tour of each of the other 3 main Islands. I saw the sea turtles on The Big Island. I loved Kauai best of the islands. Its the garden Island and had so many interesting areas to see on the day trip. (worst part was the trip back as my flight got changed then canceled and finally got on one that arrived about 3 hours later than it should have. After a 5 am start arriving back at 10 pm makes a long day). I found Pearl Harbor very educational and learnt information that also related to Japan trying to invade Australia through Darwin where my father was a machine gunner. One place I would recommend is going to the Culture Centre. It was a good day of learning about the different cultures that make up the islanders. I am so glad you got out of Waikiki as Hawaii is so much more than that area. Many Aussies do not venture further and then complain its like the Gold Coast. I got the visitor books that have vouchers and info and found a place where I could make my own lea. It was a ribbon one and I had a lot of fun doing it. Hi Jenny, Wow, a 13 day stay in Hawaii sounds amazing! I’m so glad you had a chance to visit the other islands and make your own lea. Waikiki is similar to the Gold Coast and we enjoyed seeing more of Oahu. The info on the Darwin bombing was interesting. My great uncle was based in Darwin around that time. Thanks for sharing your experience. It’s always nice to see how much alike we all are, yet there are cultural differences that are easy to point out. I have never visited Hawaii but I hope one day I will be able to. Figuring out the coins was my biggest thing when I moved to the US from Jamaica. It took me a while to get the money right😊. I never drove in JA because I was too young so that wasn’t hard to get use to, what was hard is thinking the driver side was the passenger side. It’s always a great experience learning other difference. 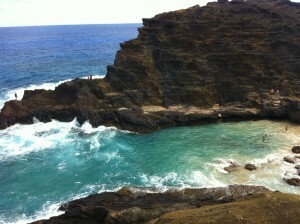 Hawaii is on my dream visit list :) one of these days I’ll make it. When my hubby was in the Army, we had orders for Hawaii. But they got changed and we ended up in South Carolina instead. Thanks for sharing your pictures! Hi Elizabeth, I hope you’ll have a chance to visit Hawaii :) It would be nice to live in Hawaii, although the Honolulu traffic wouldn’t be fun to deal with every day. Your pictures were gorgeous. I’d love to visit Hawaii some day. My husband went once before we met and got burned severely on his feet. So. ..when I mention Hawaii, he has painful memories! The only time I’ve been to Hawaii was when I was on my way to Japan. We made a stop over and I couldn’t get off the plane. So I just looked out the window. I didn’t think I wanted to go there, but lately my mind has changed. I think it would be a nice calming place. I’m looking forward to hear about and see photos of your trip to Oregon since that’s where I live. Hi Katy, I’m glad you enjoyed the photos :) I’ve done a few layovers in Honolulu going to and from writing conferences in the US. What a fabulous trip! Thanks for sharing some of your photos and memories. 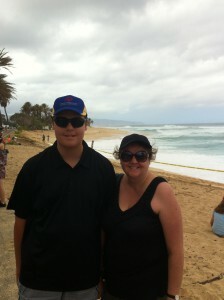 I’m so thankful you were able to go and enjoy Hawaii with your family…and may the anniversary celebrations continue! Jim and I honeymooned in Hawaii (Oahu), and we’d love to return and visit some of the other islands. It’s on our horizon as our “dream” anniversary trip in the next few years. 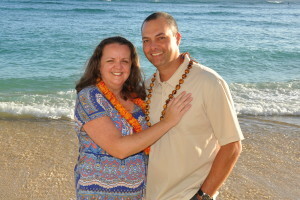 We’re trying to find a cruise that visits all the islands to combine two of our travel “loves.” Blessings! Narelle, thanks for sharing your trip. I visited Hawaii probably 20 years ago. I’d like to go back, but there are so many places in the world to see that I want to go somewhere I haven’t been before like Australia. Hi Merrillee, I hope you’ll have an opportunity to visit Australia! 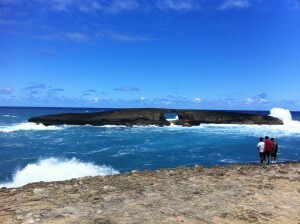 Hawaii could be a nice stopover on your way here from mainland USA. :) The airfares to Australia or New Zealand can be cheaper via Hawaii, too, depending on what deals are available from the airlines. Thanks for sharing about your trip! Beautiful pictures! I have been in Hawaii, but without ever setting my feet on actual ground there. :) I went on a mission trip to the Philippines in 2000 and our plane had to stop in Hawaii for a short period of time to refuel. No one was allowed off the plane because it was such a quick thing. 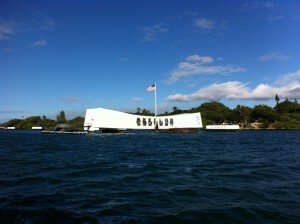 I would love to actually be able to go vacation there and especially to visit Pearl Harbor. Hi Julie, I hope you’ll have an opportunity to set foot on Hawaiian soil :) Pearl Harbor is a special place to visit. Hi Valerie, You know me too well, lol :) Writers can’t help but do research when we travel. Congrats on 20 years! Great pictures. I have never been to Hawaii, but my friend lives in Maui and is a chef. Someday I would love to visit her! I have not been to Hawaii, but my husband went several times during his time in the Navy in the late sixties. My father was a Marine and was at Pearl the day it was bombed.Your pictures of Hawaii are beautiful. Hi Carol, I’m glad you enjoyed the photos :) It wasn’t until I visited Hawaii that I learned about the large military population that’s based there. It’s hard to imagine what it would have been like to witness the beautiful and serene harbor being bombed and see so many lives lost. Your pictures are fabulous. Make me want to go back. I went to Hawaii a few years ago. I loved the Polynesian Culture Center. We spent a whole day there and stayed for dinner and the performance. It was wonderful. They also had a boat parade of the different cultures. Another fun thing we did was climb Diamond Head. The view was great. Of course, we had to stop and get some Hawaiian Ice every day! I’ve never been to Hawaii but would love to go. Happy anniversary! The farthest west I have traveled is Spokane, Washington. My husband and I have never flown but we would like to take the train on a long trip someday and possibly a ship. Happy travels to you! Next time adopt me as one of your own and take me too!! That’s my someday destination! Hi Trixi, I hope you’ll make it to Hawaii someday. :) This time I visited the central Oregon coast – absolutely gorgeous! In 2013 I visited the northern coast, travelling from Seaside through to Tillamook. Happy Anniversary! I have never visited Hawaii but is on my bucket list. Your photos gave me something to dream about.